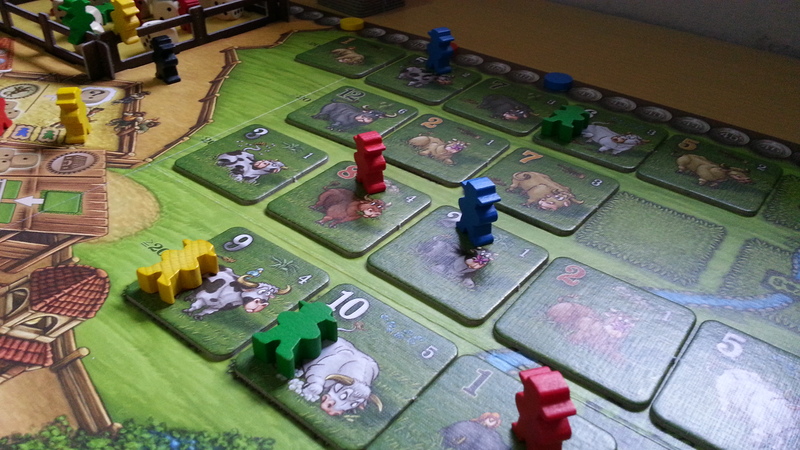 In 2014 Argentum Verlag published a board game about sheep, err… I mean cows. It’s name is El Gaucho, that sounds like Mexican? Whatever it is the game is about Cattle Barons who manage Gauchos to round up herds from the Pampa (in case you are wondering, Pampa is taken from the word Pampas, a fertile lowland located in South American, covering plains across Argentina, Uruguay and Brazil) and sell it to gain money, I hope they didn’t use that money to buy a revolver, oh wait that’s cowboys. Gauchos are nothing alike cowboys, Gauchos are local residents of the Pampa and they work by herding cattle, they are excellent horsemen, so maybe they use those money to buy horses. The game can be played from 2 to 4 players in 45-60 minutes. Designed by Arve D. Fuhler and illustrated by Dennis Lohausen who was responsible for those cute-looking cattle in the game. The game is published by Argentum Verlag in 2014. There are five different colors for the cattle, white and black cattle, white cattle, black cattle, brown cattle and golden cattle. 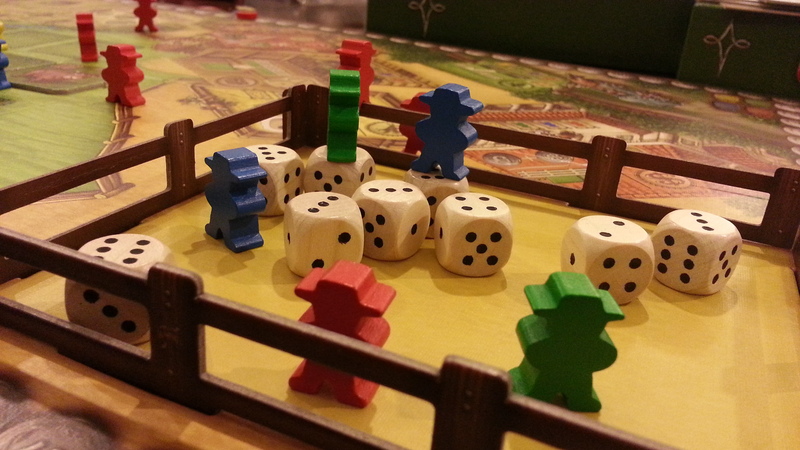 During the game players will use dice to catch cattle in the Pampa and keep them in herds. Then they can sell their herds to receive points. They can also use their dice to place their gauchos in buildings which have different uses during the game. Cows / Cattle enter the game from Pampa or pastures (there are 4 rows of pastures in the board). During each end of round each pasture is refilled with cattle tiles from the draw pile as long as the sum of the tiles in each pasture is lower than 20 (if a single pasture total is already 20 or more then no more tile will be placed even there are still empty spaces). At the start of a round, the first player will roll all the dice and then chooses 2 dice to use. These dice can be used for one or two things, either to place gauchos in a specific location or to send gauchos to capture cattle. There are 6 locations on the game, each location has a value for dice allocation, which the dice must exactly the same as listed. So with 2 dice players can send one or two gauchos, but each location can only hold one gaucho of a player. If a player still has a gaucho in that location, he cannot send another gaucho to that location. 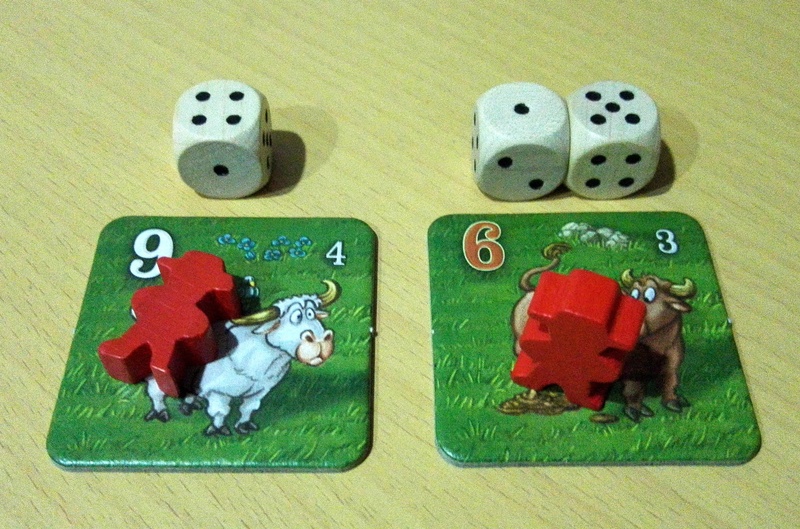 Players can use their dice to capture cows in the pastures. Each cows has a big number range from 1 to 12 and a smaller ones. These numbers determines the value of the cow itself, to buy with dice and to sell as coins. 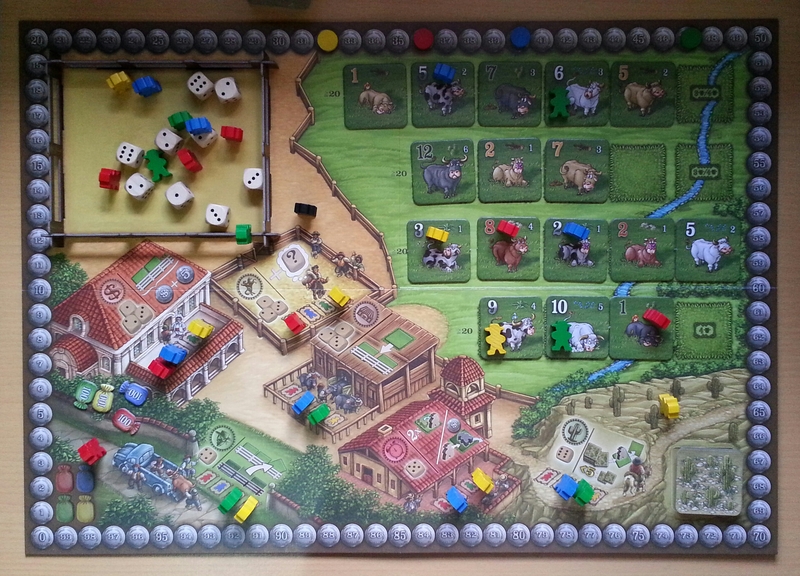 When a player buy a cow with the bigger number, he spend his die/dice according to the value and put one of his gauchos on the cow tile in standing position. But if he get it with the smaller number, he put his gaucho laid down on the tile. The difference between a laid down gaucho and a standing one is standing gauchos will take the cow to the herd at the end of the round (only if all cattle tiles in it’s row are filled with gauchos, standing or laid down, don’t matter) . While the laid down ones do nothing and can only take cows when they’re stood up. Yes they cannot take the cows back but at least they can keep out and watch the cows from other players who lay eyes on them (not it will protect the cows but at least it gives other players extra effort to take them). After a player uses up all his dice, next player in clockwise order takes his turn by choosing 2 dice from the dice rodeo (pool) and then uses the dice. The round ends when the last player already takes his turn (there will be only one die left in the dice rodeo after he finishes his turn). The player to the left of the starting player takes the black gaucho meeple as a starting player marker and collects all the dice, he rolls all of them and the next round begins. Aside from the player’s dice allocation, he can also activate a location where he has a gaucho and resolve it’s effect (not all location can be activated during this phase), he can do this before, during or after his dice allocations. The twist is that at the end of each round, players check each pasture. If all cow tiles in each pasture already have Cowboys on them, resolve them (cows with standing cowboys are taken by the owner). But if there’s at least one empty cow tile in that pasture, it’s not resolved. So with this restriction, players also figuring out the timing and situation to get the tiles. Admittedly we played this rule incorrectly, which by the looks of it, made it easier to plan things. The game ends as soon as the draw pile is empty of cattle. Finish the current round and players will get one regular round, after that there is one final round which the first player do no roll the dice, they can only use their gauchos on the board (activate buildings). After that all players’ herds are sold. Players with the most points win the game. There are some restriction to put cows in player’s herd. A herd can only consist of a single type and players can only own one herd of one type, so if he want to put a new cow he must put the cow in a herd with the same kind or he cannot choose to make a new herd if he already has a herd of that type. The herd must be lined up in a specific order, ascending or descending, in which the player decides when he creates that herd for the first time. He must adds the new cow(s) in following order (ascending or descending) from the right, so he cannot put new cows in the middle nor from the left of the line. If this somehow breaks the line, he must sell the herd first (not counting the new ones) and receives points based on the highest number on the herd multiplied by how many tiles on that herd. Then he make a new herd with the new cow tiles that breaks the herd (decides the order if necessary). To place a gaucho in this place, players have to use a single die with pip value from 1-3. When a player retrieves his gaucho from this location he can do a Sort action, which can only be taken when collecting cattle. Players can place one cattle he collects anywhere in the herd (within the same type) even at the very beginning. To place a gaucho in this place, players have to use a single die with pip value from 1-3. When a player retrieves his gaucho from this location, he adds one virtual die (with any value) to his collection. This virtual die cannot be saved up for future rounds and must be used immediately upon retrieval. To place a gaucho in this place, players have to use a single die with pip value from 1-3. When a player retrieves his gaucho from this location, he can immediately sell one of his herds with at least 2 cattle in it and received an additional 5 points. To place a gaucho in this place, players have to use a single die with pip value of 4. 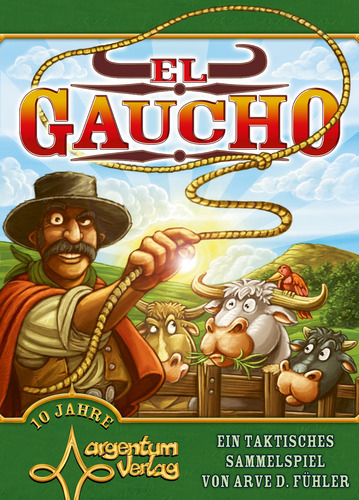 When a player retrieves his gaucho from this location, he steal one cattle tile from one of his opponents and put it into one of his herds or make a new one. If this placement breaks the order he must sell the herd and start a new one with that tile. This cannot be combine with Immediate Sale action since it’s not count as an action of the gaucho in Immediate Sale location. The opponent you stole receives compensation in points as many as the stolen cattle value. To place a gaucho in this place, players need to use a single die with pip value of 5. When a player retrieves a gaucho from this location he can either raise up to two of his lying gaucho in the pastures or replace one of opponent’s lying gaucho with a standing one of your own. For the later, the opponent will receive a compensation based on the value of the tile his gaucho is in. To place a gaucho in this place, players have to use a single die with pip value of 6. When a player retrieves his gaucho from this location he then take 4 cattle tiles from the Steppe location (right most bottom place in the game board) and then secretly look at it. He may choose to take one cattle tile (two if each tile has value of 4 or lower) and put it face up in the empty slot available in the pastures (along with his standing gaucho on each tile). If there is no empty slot available, he cannot take this action. He then draw tile(s) from the draw pile and add it to the left over tiles and put it back on the Steppe face down. The game is simple and easy to teach. On your turn you only need to choose two dice and use them, either place workers in a cattle tile(s) or in a location(s). Main purpose, getting a long line of herds and cash it in. Points are generated from simple multiplication when selling herds, the locations add interesting game flow and interactions between players. One important note is that the cattle tiles have unique values, hence you can deduct or predict the availability of a specific tiles. Sold tiles are discarded and no longer used. So in time it will become obsolete to go on for a type of cattle if most of it already sold. The basic principle is getting a lot small value tiles with one highest value tile possible from one type and cash it in, huge profit. Though it’s a Euro game, there is one thing worth mentioning, the Steal action does make the game feels quite direct tackling other players, though smart plays could lightly mitigate this. Usually in my plays, the Steal actions take place just before the game ends, because players are keeping their trump cards for last scoring. But who knows, getting another player’s tile in a perfect timing could boost your points (timing is important). If you are into light Euro with worker placement, dice allocation and simple multiplication, this might be good for you or your children. Plus, the cattle are so adorable, I did not mention the poo, did I? The most notable component in the game is the cattle, 60 tiles full of cute-looking cattle are good enough to make your day, but that’s not all, there’s also a little gimmick for the dice rodeo, which is made to look like a cage with card board fences which keep the dice inside when rolled, also adds little spice to the theme. I must say the replay value is not very high, the random factor is only on drawing of tiles during the end of each round.